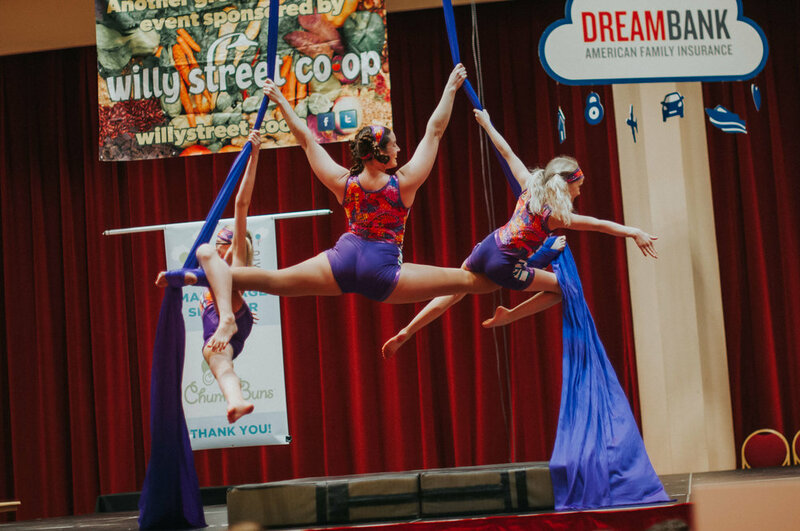 The main stage highlights local talent including mother-daughter trapeze artists, dance & martial arts showcases, music by David Landau and Declan Killeen-Toomey, and world-class juggler & entertainer: Truly Remarkable Loon! remember to check out our all-day activities too! (Please note the schedule is tentative. Show times are subject to adjustments on 3/17. Accomplishment. Pride. Respect. The Milwaukee Flyers Tumbling Team radiate these qualities. Participants exercise their bodies and minds, reaching for success in all aspects of life. Sara is the founder and Artistic Director of the Madison Contemporary Dance Company (MCVD). MCVD is a professional adult dance company offering dance concerts, workshops, community outreach classes, community concerts, and a pre-professional summer intensive. She currently teaches at A Step Above Dance in Monona, WI and judges dance competitions throughout Wisconsin. She directs the Madtown Hip Hop Crew and co-teaches with Kobby Brewoo. Kobby Brewoo, or Kidd Blaze, was born and raised in Accra, Ghana and moved to Madison, WI in 2001 with his family, in hopes for better education and more opportunities to help his family back home. It was in High School that he found his love for hip-hop upon stumbling across the TV show America's Best Dance Crew. Since then, Kobby has appeared on MTV's Made, auditioned for ABDC, and signed with DanceOn Network. He is the founder and director of The Hitterz Collective. Jess Clark, the Flying Yogi and her flying daughters Tessa and GV would love to welcome you to take flight with them today. Jess teaches and performs right here in Madison Wisconsin, and her tiny sidekicks, ages ten and twelve, are just beginning their aerial journeys. Circus is fun for the whole family, building confidence and strength while defying gravity together. Be sure to check out the mini silks rig in the All-Day Activities too. Kiddos can test it out throughout the day. All-female step team formed at East High School in 2009. Members of the team learn the history of stepping as well as friendship, responsibility and the importance of giving back to their community. Pachyderm Parade will be recorded at the Natural Family Expo...They will be recording the NFE stage performance with David Landau, Declan Killeen-Toomey and Kobby Brewoo for broadcast on March 17 at 6:30, and part 2 on Sunday, March 24th. Each Sunday evening at 6:30 WORT brings its listeners a half hour of kid’s radio including music and announcements. Kids can call in their requests and have their voices on the air. A performer that barely needs an introduction in the Madison area: Voted 2016 Children's Performer of the Year by the Madison Area Music Association. Six-year old violinist, Declan, was awarded Best Child Musician in the 2015 Rising Stars talent competition at Overture Center for the Arts. Prepare to be impressed! You can also visit the exhibit all day. 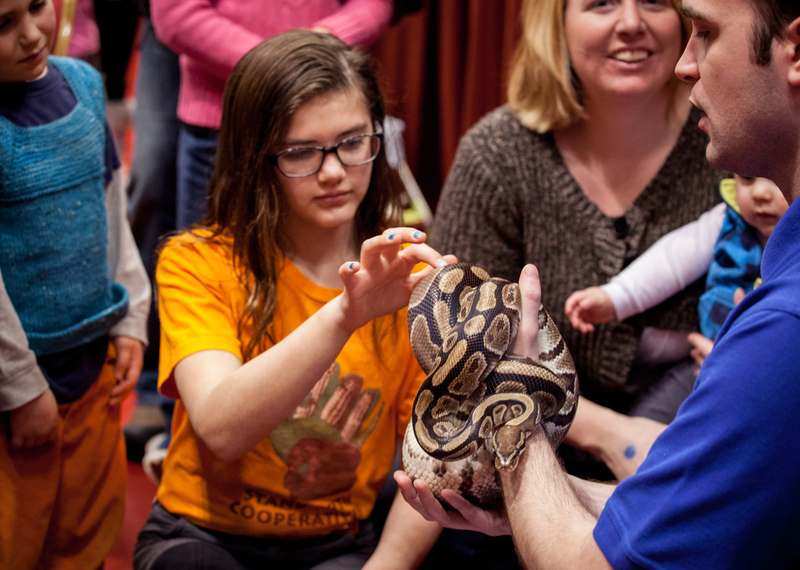 Zoozort is a unique, hands-on interactive program that features live exotic animals from all around the world. Zoozort has appeared on Animal Planet and CNN's Educational Showcase. Prepare to be WOWED! Don't believe us, watch the video. For the 6th year, Sarah Sparkles will provide an incredible hoop dancing performance followed by hula hoop lessons for the entire family. No flaming hula hoops allowed at the Terrace, but we do dim the lights to let the LED hoops shine! Ballet Folklorico Mexico de Carlos y Sonia Avila is a traditional dance group that offers dances from a variety of regions, from pre-Columbian Aztec, to tropical Veracruz, to Jalisco - famous throughout the world for Mariachis and Charros. Founded in 2013, the company has over 60 members. More than half of the dancers are children, ensuring that traditions will be carried on to the next generation. Raízes do Brasil Capoeira Madison is dedicated to promoting understanding and appreciation of Brazilian culture through the instruction, and public performances, of the art of Capoeira and other Afro-Brazilian cultural arts.